If someone suggested to you that a Nile Cruise would be a good idea for your next holiday, what would your automatic reaction be? 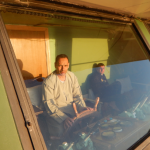 Sometimes people tell me they would find it too boring just sitting on a ship 24/7. It’s usually not a good idea to jump to conclusions. 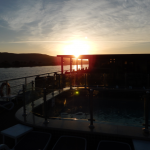 A Nile Cruise is anything but boring! 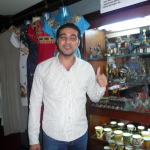 By the time you have had breakfast, lunch, afternoon tea, dinner, gone ashore to visit the temples, bought your egyptian outfits for the Egyptian Night and enjoyed the nightly entertainment…..there’s not that much time left for being bored! Woke up early and caught the sun rising! Happy Sami has everything for Party Night!! 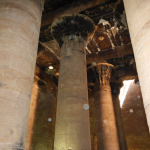 The first Temple we visit from a Nile Cruise is the Temple of Horus at Edfu – very much intact with every inch of the walls covered in stories, but you most likely would need a guide to show them to you and explain the storylines. If you are new to the mythology and stories of Egypt a good place to start would be with the Egyptian Story of Creation followed up with the romantic and dramatic story of Isis & Osiris – Goddess of Love and God of the Underworld. 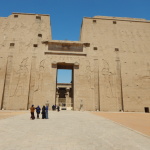 Edfu is the Temple of Horus – Horus being the son of Isis & Osiris. One long wall at Edfu tells the story of how when Horus grew up he tracked down his uncle, Set, and fought with him. After several fights Set succeeded in taking out Horus’ eye. The god Thoth put the eye back in for Horus and then Horus went on to trick Set into castrating himself (!!!). Horus succeeded in beating Set and was about to kill him to revenge the murder of his father, Osiris. However, Isis convinced Horus that he could not kill Set or the world would fall out of balance. Tourists around as we went in but had it all to ourselves when leaving – magical! At the entrance to Edfu Temple there is a little place known as the Birth House – on one cruise I was on a few years ago I could not believe my ears when a lady at the dining table retold the information their private guide had given them in the temple…….the bit that jolted me out of enjoying my wonderful dinner was “and would you believe it, right to this very day the women from Edfu go there to the Birth House to give birth to their babies!” Seriously, I am not sure if the guide had meant it as a joke but it was obvious this lady believed it. For starters, how would the woman in labour and her family helpers even get her past the security? And why on earth would she want to give birth there anyway? A little common sense would not have gone amiss there. There were quite a few tourists at Edfu but I think my companion and myself went through some sort of time warp on this particular day 🙂 cos when we came out there wasn’t a soul in sight – the temple and the silence was magical. Personally, I like to think that Orbs (see photo above) are some kind of manifestation of other spirits or beings so when they pop up in my photos I love it. My favourite Egyptian Goddess of the moment is Hathor, the husband of Horus. 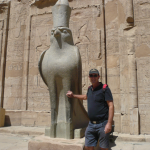 Hathor’s Temple is at Dendera which is a town the other side of Luxor. Every year the priests would bring the statue of Hathor from Dendera to Edfu by boat and each night the statues of Horus and Hathor would be taken side by side to spend the night in the Birth House – for a symbolic conjugal visit. 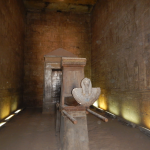 Edfu is the only place you can still see the ceremonial boat in the Holy of Holies of the temple. The Festival of Drunkness lasted for 3 days and 3 nights and took place in and around the outer courtyards of Edfu Temple. 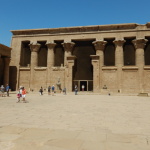 The Temple is in remarkable condition – one of the walls even has a detailed list of everything that went into the building of it – the ancient Egyptians were nothing if not meticulous in their record keeping and were the first civilisation to institute the payment of taxes. 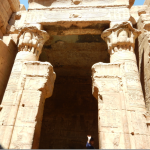 If you are going on a cruise, a trip from Luxor to Edfu by car is easy and the Temple is well worth a visit.